To get a mounted weapon in the game, pick a BASE, and the game takes care of the rest. The base is already at the proper height. Just make sure the origin of the asset is on the ground. ï¿½ï¿½ï¿½ï¿½ï¿½ï¿½ï¿½ï¿½ï¿½ï¿½ï¿½ The gunner requires at most 87 game units of space behind the center of the tripod, (33 units behind the pivot point of the standing mmg asset). ï¿½ï¿½ï¿½ï¿½ï¿½ï¿½ï¿½ï¿½ï¿½ï¿½ï¿½ The reloader requires at most 80 units of space to the left of the pivot point of the standing mmg asset. ï¿½ï¿½ï¿½ï¿½ï¿½ï¿½ï¿½ï¿½ï¿½ï¿½ï¿½ The tripod base requires at least a 40 game unit square base. ï¿½ï¿½ï¿½ï¿½ï¿½ï¿½ï¿½ï¿½ï¿½ï¿½ï¿½ The beginning of the 40 square unit base starts 24 units north of the pivot point of the standing mmg asset. A special version of the gun without a tripod could be created, as long as the height of the turret is maintained: a total of 60 game units from the ground. The gunner mounts at the origin of this asset. The reloader mounts at a point that is 51 game units to the left of the origin of this asset (west) and 15 game units behind (south) the origin of this asset. Note that the reloader mount point is turned 40 degrees towards the gun, if 0 degrees is facing north. The Main Ammo Crate is located 37 game units to the left (west) of the pivot point of the gun, and 16 units up (north) from the pivot point of the gun. It has no angle. The Ammo Pile is approximately located 108 game units to the left (west) of the pivot of the gun, and 13 game units back (south) from the pivot point of this gun. ï¿½ï¿½ï¿½ï¿½ï¿½ï¿½ï¿½ï¿½ï¿½ï¿½ï¿½ The tripod probably doesnï¿½t need a base.ï¿½ It can sit on the ground. A special version of the gun without a tripod could be created, as long as the height of the turret is maintained: a total of 17 game units from the ground. The gunner mounts at the pivot point of this asset ï¿½ 0,0,0. The reloader mounts 53 game units to the left (west) of the origin of this asset, and 9 units back (south) of the origin of this asset. No special angle is required of the reloader mount point. 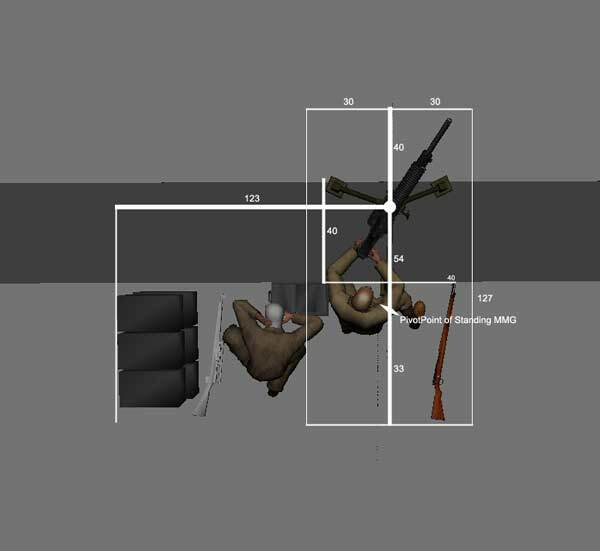 The Main ammo crate should be placed 43 game units to the left (west) of the origin of the origin of this asset, and 45 game units north of the origin of this asset.ï¿½ The Main ammo crate is angled 43 degrees towards the gun, if 0 degrees is north / forward. The Ammo pile should be approximately 50 units north and 98 units to the left of the origin of this asset, as pictured below. ï¿½ï¿½ï¿½ï¿½ï¿½ï¿½ï¿½ï¿½ï¿½ï¿½ï¿½ Reloader mount point: 52 game units to right (east) of origin of Mortar asset, 3 game units south of the origin of the Mortar asset. ï¿½ï¿½ï¿½ï¿½ï¿½ï¿½ï¿½ï¿½ï¿½ï¿½ï¿½ The main ammo crate:ï¿½ is 43 game units to the right (east) of the origin of this asset, and 36 game units up (north) from the origin of this asset. ï¿½ï¿½ï¿½ï¿½ï¿½ï¿½ï¿½ï¿½ï¿½ï¿½ï¿½ Ammo Pile: ï¿½ï¿½ï¿½ roughly 103 game units to the right (east) of the origin of the Mortar asset, 25 units up (north) of the origin of the Mortar asset. ï¿½ï¿½ï¿½ï¿½ï¿½ï¿½ï¿½ï¿½ï¿½ï¿½ï¿½ The tripod base requires at least a 53x53 game unit square base, with its pivot point 11 game unit south of the pivot point of the tripod. A special version of the gun without a tripod could be created, as long as the height of the turret is maintained: a total of 30 game units from the ground. The Gunner mounts at this assets origin. The reloader mounts 41 game units to the left (west) of the origin of this asset, and 25 units back (south) of the origin of this asset. The Main ammo Crate should be 58 game units to the left (west) of the pivot point of this asset, and 27 game units up (north) of the origin of the pivot point for this asset. This Main crate also needs an angle of 23 degrees, angled towards the gun, as if 0 degrees was facing north. The ammo Pile is located approximately 105 game units to the left (west) of the gun, and 25 game units up (north) towards the front of the gun, all in relation to the origin of the guns pivot.